Nvidia's GeForce GTX 1060 graphics card is a compelling option for gamers who want the performance and feature benefits that Pascal delivers without the higher price tag of the GeForce GTX 1080 or 1070. As such, its hardware partners have been quick to respond with custom variants, including Gigabyte, which just unveiled a three-slot solution wielding its WindForce 2X cooler. It's the GeForce GTX 1060 Xtreme Gaming with 6GB of GDDR5 memory. Like the non-Xtreme version of this card, Gigabyte is taking aim at overclockers with premium parts consisting of a 6+1 power phase design and high-grade metal chokes and solid capacitors. These cards also use cherry-picked GPUs from Gigabyte's Gauntlet Sorting effort, which is supposed to separate the better performing chips from the pack for use in its highest end cards. Notice that the non-Xtreme Gaming version's OC clocks are the same as the Xtreme Gaming's card's regular Gaming mode. Part of the reason for the faster clocks is the other differentiating factor, the WindForce 2X cooling solution. The cooler on the Xtreme Gaming model makes the card a three-slot solution. It features a pair of 100mm blade fans rotating in opposite directions to optimize airflow while keeping air turbulence to a minimum. A heatsink with an angular fin design and four composite copper heatpipes and a large copper base plate sit beneath the fans. Other notable features include customizable RGB lighting and a sturdy backlate to keep this three-slot monster from bowing. 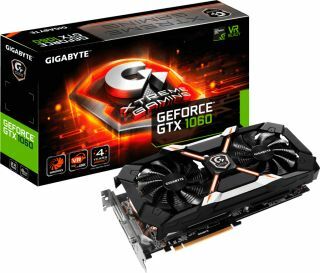 Gigabyte didn't say when its GeForce GTX 1060 Xtreme Gaming will be available or for how much, though as a point of reference, the non-Xtreme variant without a WindForce cooler streets for $290.